How Powerful Is Manny Pacquiao's Left? Ricky Hatton Knows. Manny Pacquiao is obviously a big, big hitter. With people like myself and Miguel Cotto, who move straight down the middle, there's always a chance you can walk on to that left-hand shot, and it was sadly the case with me. There was always a chance, with my style, that I could have outmuscled him and outpunched him and mauled him, like I did Kostya Tszyu and a few others. I'd always been aggressive, I always went for the knockout--and that proved my downfall, really. He wasn't even looking at me [when he landed the knockout punch in the second round]. I think he just knew where I was, he winged it over and that was that. His short left is very good. He's had many successes with it. I've always been a little bit reckless, but I got a little bit over-reckless in that fight. You can't do it at that level. With someone with a left hand like Manny Pacquiao's, you can't go in like that. I think a lot of people have learned that with Pacquiao because the fighters who are a little bit more cagey and a little bit more safety-first tend to have fewer troubles. With Manny Pacquiao, there's every chance he can knock you out. Timothy Bradley can do a little bit of brawling and boxing. He can have a little bit of a fight, but he's a very well-schooled all-rounder. He's a very capable boxer, a very talented fighter. I think he'll come in and fight a cagey fight and I think he'll give Manny a few problems. I don't think he'll win, though. After the third Juan Manuel Marquez fight, Pacquiao will want to come back and destroy somebody. 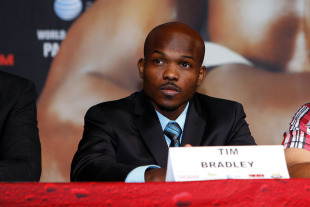 Timothy Bradley might be in the wrong place at the wrong time. Go to HBO.com for more fight videos. His guy, he believes, has it, and the other guy doesn’t. And when he says speed, he doesn’t just mean that Pacquiao’s hands are fast. More importantly, his feet are as well. He believes the Filipino icon’s unpredictability will be of particular advantage against an aggressive fighter like Bradley, whom Roach is convinced will take the fight to Pacquiao – even if the champion doesn’t necessarily agree. Manny Pacquiao - Photo Credit: Chris Farina - Top RankAnother insight Roach is confident about is that Bradley will not attempt to emulate the comparative success of Juan Manuel Marquez, who last November came dangerously close to defeating Pacquiao in the third installment of their contentious rivalry. Marquez always provides difficult opposition for Pacquiao because of his ability to lure the Filipino off balance and then fire a succession of hard counterpunches. But if Marquez has provided the theoretical blueprint for beating Pacquiao, that doesn’t mean Bradley will be able to take advantage. Immediately after the post-fight press conference on Saturday night, Roach will fly to Canastota, New York, to be inducted Sunday into the International Boxing Hall of Fame. Asked which would mean more, the induction or a Pacquiao win, Roach doesn’t hesitate. Will Pacquiao-Bradley End in an Upset? Members of the media packed the Hollywood Theater at the MGM Grand on Wednesday and made their final predictions about this weekend's mega-fight between Manny Pacquiao and Timothy Bradley. Most boxing experts favored Pacquiao -- with one very notable exception -- and of course the fighters had their own opinions on what will go down in the ring this Saturday night. For more than three years Manny Pacquiao and Floyd Mayweather Jr. have engaged in a tension-filled match-beyond-the-match in which each had to hold serve to preserve this decade's "The Fight of the Century." The stakes couldn't have been higher, for one slip-up by either and the projected $150 million purse split goes up in smoke. Mayweather struggled at times against Miguel Cotto last month, but a stirring stretch drive helped preserve his much-cited perfect record and placed the onus squarely on Pacquiao. On Saturday "The Pac Man" will face the undefeated Timothy Bradley in a bout whose significance goes far beyond his fourth defense of the WBO welterweight title he won from Cotto two-and-a-half years ago. It's his chance to regain the edge in his head-to-head race with the man called "Money" in terms of pay-per-view numbers, bargaining position and conventional wisdom -- all of which Mayweather has led as of late. See more Compubox analysis of Manny Pacquiao vs Timothy Bradley on HBO.com. The last time Timothy Bradley was a big underdog in a title fight was four years ago. He was undefeated, as he is still, and largely unknown – which, to the broader public at least, he remains. And, before he received his $65,000 purse for fighting England’s WBC super lightweight champion Junior Witter, he was broke. Defeating Witter made him a champion, but it didn’t make him a star, didn’t catapult him on to the big stage. Seven fights and 49 months later, he is guaranteed $5 million and a chance to banish the memory of those monetary woes forever. More importantly, he has the opportunity for recognition, and the shot at greatness he has long sought, when he challenges Pacquiao at the MGM Grand on Saturday. It is an opportunity he insists he will not let slip through his fingers. Manny Pacquiao and Timothy Bradley arrived Tuesday at the MGM Grand in Las Vegas for their fight Saturday night on HBO PPV. Kieran Mulvaney was on the ground to ask the fighters -- and their fans -- what would happen during this weekend's bout. Do you think a hungry Bradley has the skills to take Pacquiao down, or will this be yet another victory for one of boxing's biggest icons? Watch more fight video at HBO.com. Can a young and hungry Timothy Bradley upset the legendary Manny Pacquiao? Watch Under the Lights, a video infographic that takes you inside their bout this Saturday.